To tell the truth, not much is new – just the same old same old. As noted in previous issues, this is supposed to be a column that critiques other hoya publications. I am at least a year behind in my promise to do that. It’s hard to keep abreast of these publications when there are people bound and determined to obtain immortality by publishing every known species at least twice and have such overactive imaginations that they can see and describe flower parts in pictures that look to me like blobs of debris -- and some of that debris doesn’t even look like plant debris!!! Actually, I have seen clearer pictures of hoya flower parts outlined in the clouds above my head while day dreaming in my hammock on a warm summer afternoon (back when I had time to day dream in my hammock) --- I’ve also seen Moses and the Red Sea parting in those clouds. Sometimes I have wondered if the pictures Kloppenburg publishes and labels as hoya species might have originated in those same clouds! If one has a vivid imagination one can see all kinds of picture up there in the sky. One can see visions in smoke rings too. I know because I used to imagine all sorts of things (mostly bugs and monsters) watching the smoke billowing from grandpa Hudson’s and Uncle Hamp’s corncob pipes as I sat at their feet near their rockers on lazy Sunday afternoons. 1). He said, “It has a campanulate corolla, like Hoya blashernaezii Kloppenb. but differs in being smaller. 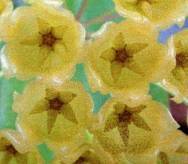 Did you ever see a Hoya heuschkeliana flower that didn’t have an urceolate corolla? I haven’t. Something is definitely wrong here as all hoya corollas are shaped like 5-pointed stars. This looks more like an insect chewed Zygocactus flower or a wadded up and twisted piece of a cotton ball after being used to clean the lipstick off ones collar before ones wife spots it!. One thing is 100% certain. That is not a corolla that at all resembles a Hoya blashernaezii corolla or a Hoya heuschkeliana corolla. Hoya blashernaezii corollas. Hoya heuschkeliana corollas. Do you think Kloppenburg’s corolla looks like either of these? If you do, then one of us has a serious eye problem that needs immediate medical diagnosis. I don’t think it’s me as I’ve been able to see quite well since getting my implants! See Kloppenburg’s book, Hoya Section Acanthostemma, page 73. As I’ve said before, it looks like a topographical map of some third world island! --- Or one of those Rorschach inkblots that shrinks ask their patients to interpret in order to get inside their minds. Okay, you shrinks out there, what does it mean when someone calls that a “flower” (a crown and a corolla almost equals a flower – the showy part anyway)? Turn it on its side and it looks sort of like a 4 legged animal (at rest – with heads at both ends, like the fictitious “Alicroc”) with its front legs extended outward and upward and the other two tucked underneath. What it doesn’t look like to me (and, I believe, anyone with good eyesight and half a brain) is a hoya flower! 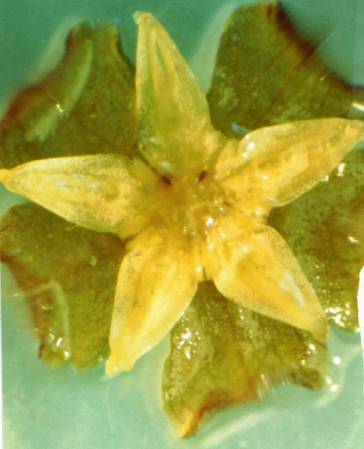 When describing flowers on dried specimens, I think it presumptuous to assume a corolla is campanulate unless the collector (who saw the flowers in the living state) wrote on that specimen that the flowers were campanulate. Kloppenburg, obviously did not see this species in the living state. Hoya flowers go through several stages as they mature. The buds of all, except urceolate flowers, open and appear for a short time as campanulate; then as rotate and finally, at maturity, campanulate, reflexed, or revolute (according to the nature of the species). Then they reverse the order so that by the time they are about ready to drop off the peduncle, they are again campanulate or even almost closed, like buds. Hoya carnosa flowers, for example, though rotate at maturity, could appear campanulate on a dried specimen, if the specimen had been collected and mounted after they had passed maturity and had reached their mid-stage of closing up. 2). He said, “The corona is like Hoya loheri Kloppenb. 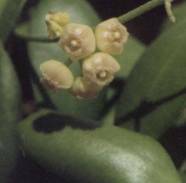 but differs in the bi-lobes being obtuse.” I have never seen an Acanthostemma flower with corona bi-lobes that were anything but obtuse and that includes the hoya Mr. K. calls Hoya loheri. I am confident that he hasn’t either. In a profile picture the lobes of this species look somewhat acute but they don’t look like “bi-lobes” from that angle either. 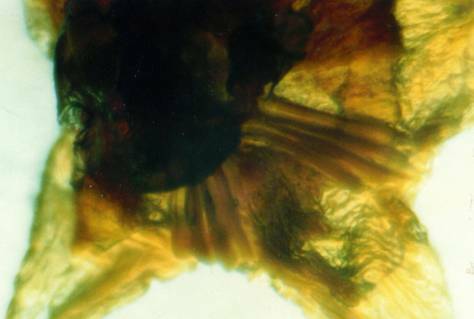 Looking at a corona lobe “straight-on” one can see that they are, though narrower at the tips, rounded – in other words, obtuse. DK’s corona profile on page 10 of Fraterna 20(4). Left: Hoya loheri (or what DK claims is Hoya loheri) showing lobes in profile. Right: Hoya heuschkeliana corona profile. If you see any resemblances there, I can only speculate on what you’re smoking, if you are smoking! Can anyone tell me just what use this picture is to anyone? It is labeled as being a pedicel. I am 100% sure that this picture will never be one iota’s worth of good in helping anyone identify this hoya species (nor will any of his other pictures). It is only wasted space and wasted money publishing it. Aren’t there any IHA members complaining about all the waste they are paying for in these bulletins? Fraterna 20(4) contains another very puzzling publication. It is Hoya ramosii. This, as all Kloppenburg publications, is copiously illustrated with pictures that only God could identify as being what they are labeled. His written description of this (and most) is beyond my understanding and, unless all my schools’ testing was flawed, I have above average I. Q. One term that he doesn’t appear to know the meaning of is “Anther Wings.” In this instance (and in many others I could name) he has declared that the corona has double anther wings and illustrated these double anther wings in three pictures that showed the corona, with text pointing out those “double anther wings.” I assume that he was referring to the tissue on each side of a corona lobe, as that is what all other hoya authors call “anther wings.” However, there is a group of six pictures on page 18 that show bits and pieces of a pollinarium. 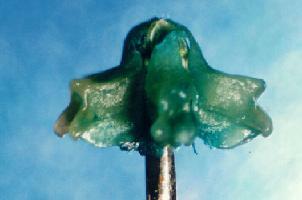 The text says, “Pollinium from a flower Mostly (sic) only the retinacula (sic) and anther wing in one frame. This was the best I could do.” * Friends, there is no anther wing in any of those pictures because pollinaria don’t have anther wings. 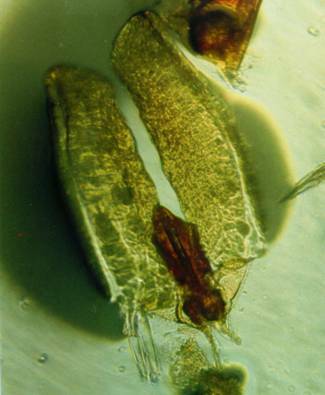 Pollinaria are found in an area of the flower just above the anther wings and they are partially (sometimes entirely) covered by the anther appendages (other parts Kloppenburg frequently calls anther wings). * The best that he can do, isn’t good enough! If you paid for it, you were cheated. COMPLAIN! – LOUDLY!!!! I will not waste time reprinting the 11 pictures that illustrated this publication (or I should say that failed to illustrate anything at all due to such poor quality) but I’d like to show you three pictures that were taken by Mr. Kloppenburg and sent to me via snail mail in 1990. All three of these pictures were labeled on their backs as being Ramos #75500 (which he cited as the holotype of this new species – if it is one, which I doubt). I think they prove only one thing and that is that, even if you can make sense of the pictures this man uses to illustrate his publications, there is serious doubt that the pictures represent the species he thinks they represent. I have about a hundred pictures taken by Mr. Kloppenburg that I can prove he mislabeled. Once he gets his film developed, he guesses their identity. I can show you many examples of his labeling identical pictures with as many as 8 different names. This pollinarium is labeled on the back (by Kloppenburg) as “Ramos #75500” – He says that Ramos #75500 is an Acanthostemma. I plum, flat-out guarantee that this is not an Acanthostemma pollinarium and neither are any of those in the 6 pictures labeled as Ramos 75500 pollinaria in this Fraterna 20(4):18. I guarantee that this pollinarium isn’t from the same species as those are either! ALL THIS PROVES IS THAT MR. KLOPPINGBURG HASN’T A CLUE ! ONCE IN PRINT, IT NEVER GOES AWAY --- AND I AM CHEWING NAILS-SPITTIN’DARTS ANGRY!!! It doesn’t matter if what you write is published or if it is only in private correspondence, once it is in print (or written by hand) and passes from the writer’s hands to another’s, it just won’t go away. Many IHA members have been very critical of me because I dare to criticize DK, TG, AW and the entire IHA organization. One letter writer wrote a very vile letter to me asking me how I dared even suggest that Dr. Kloppenburg who had a PhD in taxonomy was wrong about just about anything having to do with plants. My reply was that MISTER Kloppenburg did not have a PhD in anything and that, as far as I know has only a BS and that BS stands for - er – never mind! His BS is in Agronomy, not taxonomy. His title is Mr., not Dr.
IHA and its “holier than thou, goody-two-shoes” statement of its policy of not commenting, in its publications, on what I write has a lot of people fooled into thinking it and its officers are more ethical and have more morals than I. That’s pure hogwash! While I am openly critical, I at least offer my readers documentation which gives them the facts. They DO comment on what I say in letters that make the rounds and they obviously think I’ll never see them, however, those who get those letters send copies of them to me, almost as soon as they get them. Sure, I make mistakes. I’m only human. When I make mistakes, I also make an effort to correct them. At least I acknowledge my mistakes which those people rarely do. And I challenge anyone to compare the ones I make with the ones DK makes. I’m sure you’ll find that mine can be classed as “normal human error” and his in a category beyond human comprehension. The thing that has me riled up now is a letter written by R. D. Kloppenburg to someone named Owen. The letter is dated Friday, March 15, 1996. I was sent a copy of that letter within a week after it was written. I received another copy of that same letter (from someone else) about 5 years later. A copy of this same letter showed up here just this week (February 14, 2008). It appears to have been traveling about and has covered a lot of territory since Kloppenburg wrote it. Yes, I know he wrote it because I’d recognize his writing anywhere, any time. I’ve seen enough examples of it. Also, Mr. Kloppenburg repeated some of the same things he said in it on a Internet forum I was once in. What he said was 100% false and, I thought, said with the intention of discrediting anything I might say. I replied to the letter, truthfully. I was thrown off the forum for replying to it but he was kept. Just more proof to me that many hoya lovers are more interested is “kissin’ up” than learning facts. I should probably listen to my 8th grade English teacher, who always said, “Never explain! Your friends don’t need it and your enemies won’t believe you anyway.” I do feel that, in this case, I am entitled to an explanation. I am trying to augment my income by selling a few hoyas. It hurts me to have people believe that my plants are sickly. My plants are not sickly. In fact, Mr. Kloppenburg was not, at that time buying plants from me AND he had NEVER seen any of my plants growing in my greenhouse. He had visited my place only one time. That was in 1984, shortly after my furnace died the first time in history that we had a below zero F, temperature in the state of Georgia. I didn’t have any hoyas at all when he was here, except some cuttings HE brought with him, about half of which I had to destroy because they proved to have an unattractive virus. The reason for his trip was this: I had phoned Ted Green, who’d maintained that all Hoya type specimens were destroyed in WW-2, therefore, I’d never be able to prove any of his (TG’s) off the top of his head identities were wrong. I told TG that not only were 73 of Schlechter’s hoya holotypes still extant but that I had them on the lab table at Fernbank in front of me as I spoke to him. Ted didn’t believe me so he called Dale and asked him what he knew about it. Dale had a seed salesmen meeting in Nashville a couple of days later and he had to change planes in Atlanta (no one can go anywhere in the SE US without changing planes in Atlanta, not even if they are going to heaven or hell – or so they say). He decided to start his trip a day early and invited himself to visit me. He wanted to see for himself if I really did have those specimens. He also wanted to see if those specimens were, as Ted repeatedly says all herbarium specimens are, leafless twigs. His plane was supposed to land around dinner time in the evening so they did not serve dinner. He had invited me to dine with him in a local restaurant (my choice). So I didn’t eat dinner. The plane didn’t arrive until 10:30 p.m., by which time I was starved and most restaurant kitchens had closed. It took us about two hours to find something open, after which we had a 45 minute drive home. DK was able to look at those specimens but NOT to examine them. He saw each one for about the same length of time it would have taken him to turn the pages in a book, but he still named and published several of them for his children and cronies. During the time he was here, it rained pitchforks and hammer handles. The sun never even peeped through a cloud. I thought that was why he was mixed up about directions when on the way back to the airport (when we were about half way there) he demanded to know why I had turned around and was heading in the opposite direction. I said, “I haven’t.” He replied, “But that sign says we are heading north and the airport is south of your house. I told him, “No, the airport is north of my house. Wouldn’t you think he’d assume I knew that? Nope! He argued with me, saying that he knew I lived north of the airport so I had to be traveling in the wrong direction. I have since learned, from reading his writing that Kloppenburg doesn’t know east from west, north from south or up from down. Examples: On page 3 of World of Hoyas, he states that Sri Lanka is off the southwest coast of India. All the maps I’ve see show it off the southeast coast of India. On page 8 of World of Hoyas, he created a geographic area which included “Celebes, Malacca and the Moluccas. Malacca is a city on the Malay Peninsula in the northern hemisphere. The Celebes and the Moluccas are island groups in the southern hemisphere. On the same page, he created another geographical group which included Amboina, Timor and Nicobar. Amboina is an island in the Moluccas. Timor is an island just a little southeast of the island of Java, Indonesia. Both of these are in the southern hemisphere. Nicobar is an island group in the northern hemisphere, just southeast of India. On page 107, he says, “The island of Hainan forms the western side of the Gulf of Tonkin, opposite Hanoi.” Anyone with a map of Asia ought to be able to see that the island of Hainan is east of the Gulf of Tonkin. In his Acanthostemma book, he shows us a picture of a pollinarium, which he says came from the herbarium specimen, Grether & Wagner Jr. #3949, which he stated had been collected at Pitilu Lagoon, Los Negros, Philippines in 1945. 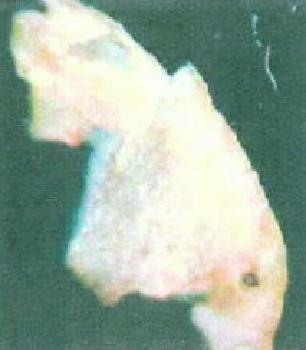 Friends, I have seen that specimen and made a Xerox picture of it. 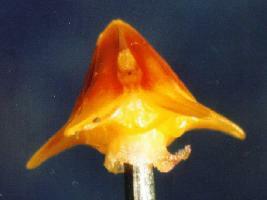 It states, quite clearly that the specimen was collected at Los Negros in the Admiralty Islands. The Admiralty Islands are in the SW Pacific, in Bismarck Archipelago, part of the Territory of New Guinea. The Philippines are in the northern hemisphere, while the Admiralty Islands are a very long way from them, to the SW in the southern Hemisphere. An example (above) showing that this man doesn’t know up from down can be found in his book, World of Hoyas on pages 118 and 119. This page is devoted to Hoya imbricata. 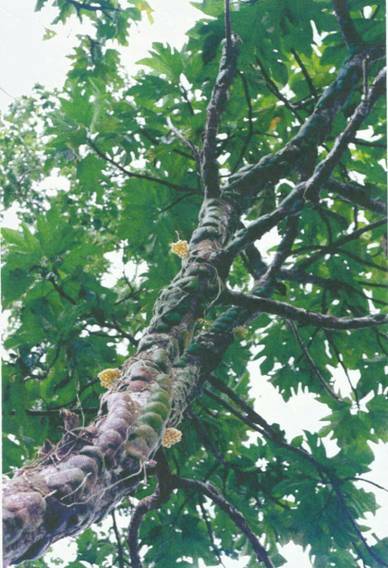 He said on page 118, referring to the clusters of flowers, “The clusters are held upright.” On page 119, there is this picture (see above) of a vine growing up the trunk of a tree. The vine almost completely covers that tree trunk. We know that the picture is upright because we can see the upright, leafy branches with lots of blue sky behind the branches and the foliage. There are 4 large umbels of flowers and three small ones (possibly at bud stage). All of those umbels hang straight down, definitely not upright. His statement that my plants were unhealthy assures that anyone who doesn’t know the situation will not buy my plants. His blaming the pine trees that shaded my greenhouse for this was an out and out lie. I wish I did have a lot of pine trees shading my greenhouse, my house and my yard. I love pine trees. The fact is that I have only 4 pine trees in my back yard and none of them shade my greenhouse. All of these pine trees are north of the greenhouse (from 12 to about 50 feet north). Just in case you aren’t aware of it, trees in this hemisphere do NOT cast shadows to the south so none of those pine trees has ever cast a shadow on my greenhouse. And even if I had one on the south side of my greenhouse (which I don’t), it isn’t likely that it would cast a shadow on it. Southern pines don’t make much shade anyway as their branches are short and so high off the ground that the best they can do is filter the sunlight and then only when the sun is directly overhead. That is when shade is needed. What shades my greenhouse? Well, I do have a large oak tree that casts a shadow on the northeast corner of the greenhouse, giving me about a 5 by 7 foot shady spot which I find useful for keeping my Holiday Cacti and ferns in some needed shade. The greenhouse is 36 feet long by slightly more than 12 feet wide. It is 12 feet tall on the north side and 8 feet tall on the south side. It is located on the southern boundary of my property. There are NO trees south of it. The closest trees to the south are about 700 feet to the south! HELP WANTED: An Obeah. Have pictures of useful targets! Will supply free of charge! --- Just joking? !